Earlier this summer I wrote about the bonsai class I took and how we’re trying to make taking care of these trees a family activity. So far it’s been going great. Having the kids help with watering is very helpful for me. We water following a three-step process I read about, and together it can take a good 20-40 minutes. Having the kids involved makes it fun. 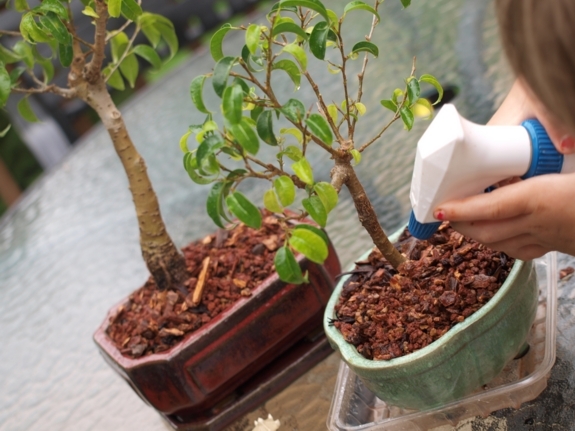 Step #1: Spray the plant and the soil with water. This prepares the dry soil to absorb water. Step #2: Fully saturate the soil. Once a week we do this with a 50%-strength mix of Miracle-Gro. Step #3: Come back ten minutes later and water again to wash toxins away from the now rehydrated roots. Recently plant maintenance led to a lot of questions about roots (what do they do?) and leaves, and why we water, and what’s Miracle-Gro for. Right now there are a lot of opportunities for these discussions as we play outside, but soon snow will be blowing, and the bonsai will come inside giving us opportunities all winter long.